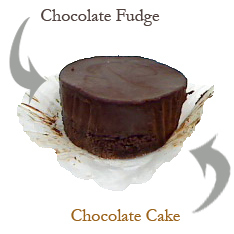 Ingredients: water, whole eggs, margarine, agave, sugar free chocolate, pastry flour (contains: wheat flour, niacin, iron, thiamin mononitrate, riboflavin, folic cid), modified food starch, nonfat dry / skim milk, maltodextrin, vanilla extract, vanilla guar gum. Allergy warning: this product contains dairy, egg, and wheat. A small, light, flaky, sugar free eclair filled with sugar free vanilla cream and covered with sugar free chocolate syrup. 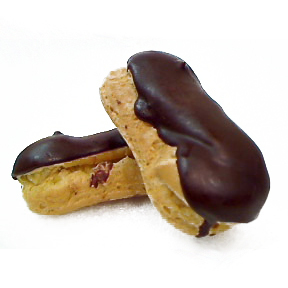 Each eclair is approximately 3.6 inches long and 2.25 inches wide. This product is for a package that contains 5 mini eclairs. Each eclair is 2 servings.